So here we are again with a round up of this week’s small pleasures, which I forgot to post yesterday, Monday. It is now July, and so the middle of winter, though at least we have had the shortest day, and there are only two more months of winter to get through! Look funny, taste wonderful when roasted. Vegetables around just now are swede, Jerusalem artichokes, cabbages, parsnips and pumpkins. Forget about salads and cucumber and focus on roasting root vegetables. Sunshine and blue skies were the order of the day on Saturday. After Pilates, I had a walk along the waterfront, something I hadn’t done for ages (see featured image above). 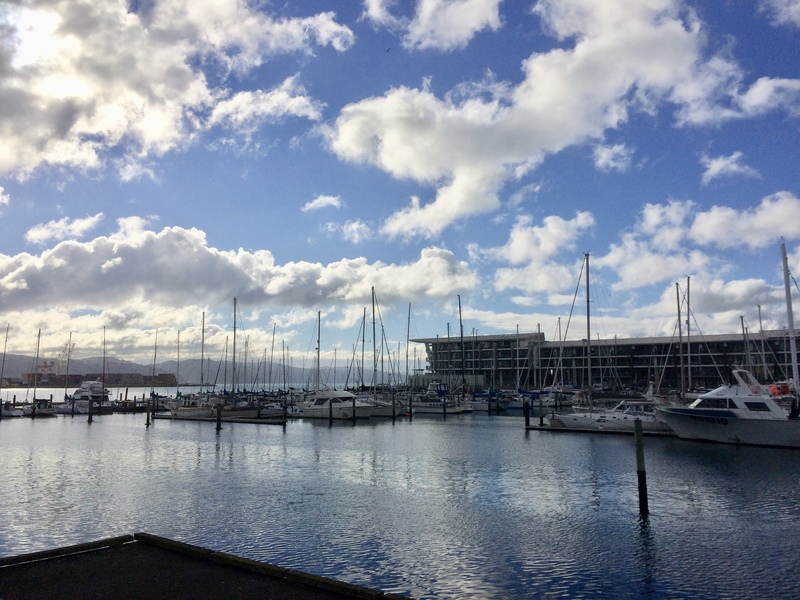 I was walking along the waterfront because I was heading to Winetopia, a wine tasting event celebrating the diversity of New Zealand wines (for those of you living in Europe, New Zealand produces a whole lot more than just the sauvignon blanc you pick up in the supermarket). We went last year, and found the venue a bit cramped, but this year it was moved to the larger space of the TSB Arena, which made the whole event so much more pleasurable. There were comfy sofas to sit on, and more food too. We grabbed sandwiches from Boulcott Street Bistro’s stall, which were just the thing to soak up all the wines we tasted. Strictly speaking, this was one of last week’s small pleasures, but it lasted all week and got better by the day. This moist cake was made with marmalade and rosemary, then topped with rhubarb. Sounds a bit strange, but it was so good.